This weeks cookbook challenge is potato, and I admit I was stumped for a minute. The only potato dishes that came to mind are quite boring and wouldn’t photograph well. 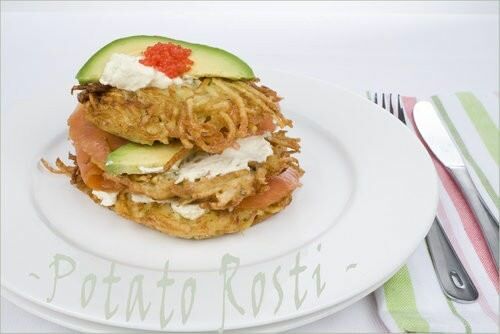 I wanted to do something a little more interesting.The result is this very tasty Potato Rosti & Smoked Salmon Stack. I made a variation of this dish with bacon, avocado and tomato for the little kids which they loved. You could even top these with some smoked chicken, roast garlic aioli and spinach for a lunch or dinner version. Another great potato breakfast is the classic Spanish Omelette, Tortilla Espanola. It goes perfectly with a slice of hot buttered sourdough toast, especially when the sourdough is fresh from the bakery! Use a food processor to grate the onion and potato. Squeeze out the excess liquid. Add chopped garlic, flour, eggs, salt and pepper to taste. Mix with a fork. Heat the oil (1cm deep) in a frying pan with a solid base, like a cast iron pan. Form nine balls and flatten in your hand as you gently place them into the oil. Flatten again with a metal egg flip. Fry the rosti until golden and well cooked. Turn to cook the other side. Drain on absorbent paper. Combine the yoghurt, dill, lemon Juice and cucumber in a bowl. 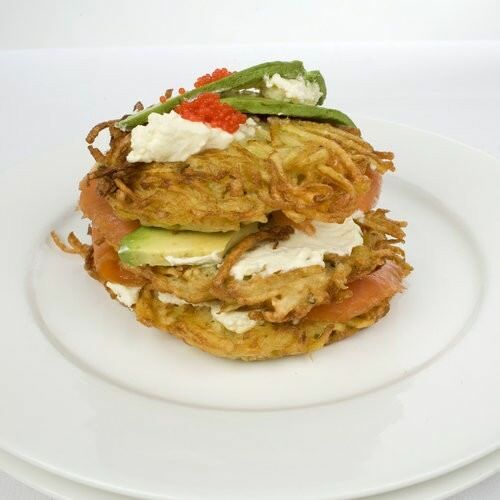 Starting with a rosti, layer smoked salmon, yoghurt and avocado until you have three layers. Finish with a rosti and then add some yoghurt, avocado and caviar to garnish the top.